Great news for your skin…the festive party season is now behind us! It’s the perfect time to learn more about your skin, start the skin detox and properly take care of it to ensure you have healthy skin for years to come. That’s why we’ve created this comprehensive post to give you a deeper understanding of exactly what your skin is made up of and a plan to how you can protect it. So, if you are looking for some simple, expert tips to cleanse and protect your skin and fight ageing from the offset in 2019 – keep reading. To really understand the health of your skin, it’s important to know how your skin works and the many different factors that can impact it. So in this practical guide, we’ll cover skin structure, skin empowering foods, supercharging activities and the #1 secret to fight ageing that provides stunning results. In a nutshell, our skin structure consists of three different layers; together, they act as a shield to protect the body. 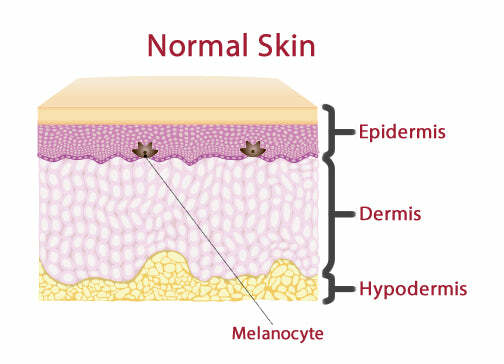 Epidermis: The epidermis layer is our skins natural barrier. Structured like a brick wall it helps to maintain a balanced pH – its integrity is vital to the health of our skin and our overall wellbeing. Dermis: This layer is effectively the scaffolding of the skin; it’s the structural support that is responsible for giving our skin its shape and flexibility and is the area that you can make the most change to by having regular treatments and using the correct products. Hypodermis: The hypodermis layer is a vital energy source that allows different bloods, lymphatic vessels and nerves to travel up to the middle and top layers. What impacts the condition of your skin? It really is an understatement to say that everyone’s skin is different. Everybody leads a different lifestyle and the manner of things that can have an impact on your skin’s health is phenomenal. It’s our skin that often suffers first so it’s key to look at your lifestyle and see the little changes you can make to maintain healthy skin right through to the new year. From your diet, (including what you eat and drink to your level of fitness) to things like medication and genetics, your stress levels, pollution and more, each of these different factors can be the cause of common skincare concerns from toxins such as acne, uneven skin tone and dehydration. This is critical to start the healing process and continue to protect your skin to fight against toxins. Increasing your water levels provides your skin with a wealth of benefits from reducing dehydration, to giving your skin the vital nutrients it needs to help the rejuvenation process. With the above in mind, here are some key steps you can take to protect your skin and start the skin detox after the festive season. Sleep: There’s a reason it’s called beauty sleep. It’s one of the biggest factors impacting the health of your skin so it’s important to aim for at least 8 hours of sleep a night. Exercise: Ensuring you have regular exercise also helps to promote healthy skin. Not only does it nourish the cells, but it also improves the circulation of your blood by producing more oxygen. You may associate SPF with summer heat waves or your holiday essentials but SPF is a vital product that we should all be using every single day even in the winter – and that doesn’t mean in your moisturiser or foundation; it should be a separate SPF to really give your skin the many benefits it provides. So why is it so important? Wearing an SPF protects your skin against sun damage and prevents anti-ageing. A minimum of factor 30 should be worn no matter if you’re indoors or outdoors and all year round. UV rays (the cause of sun damage) are still present on cloudy days and can still impact the skin through windows. Get your skincare routine right. Your skin is one of the first giveaways of age, it naturally changes in appearance as we get older. Committing to a morning and evening skincare routine is so important to maintain healthy skin. By getting into a routine, you’ll be protecting and improving your skin barrier every single day and night just with just a few simple, home remedies. With the skincare market overly saturated with ‘miracle’ products, it’s hard to know where to start and which brand to invest in so it’s worth doing your research and reviewing the products you currently have at home. We recommend Epionce to all our clients – the skincare products by Epionce not only have a powerful therapy but proven results too, which is why doctors and medical aesthetic clinics favour the brand right across the UK. For a monthly skincare MUST for STUNNING results, read below. Professional treatments work wonders to enhance your at-home skincare routine. It’s important to note that just having treatments alone won’t have the desired impact on your skin if you’re not looking after it in other ways too. Just like going to the gym and then eating chocolate every day, it won’t help you to lose weight. Having regular treatments without looking after your skin for the rest of the year won’t improve its health and appearance. In January, you can take advantage of Tej & Co’s wealth of experience and knowledge by identifying what is currently affecting your skin. We will then be able to advise on the correct treatments to aid your concerns and start your skin detox for 2019. …and of course, healthy skin. We’ll then advise you on your skincare routine and benefits of products and treatments that will help address any skin concerns. You’ll also be able to try some of the products for feel and texture. By having a detailed skin analysis it will ensure the best outcome for your skin. At Tej & Co we pride ourselves on being experts in skincare and use the very latest technology to provide the most effective skincare treatments on the market to treat our clients’ skin concerns like sun damage, dehydration, acne and rosacea. Discover how you can achieve your healthiest skin for the festive season and beyond by booking a COMPLETELY FREE* Skin Analysis with us today. This exclusive offer is ONLY available during the month of January, so book now to avoid disappointment. Just give Tej a call on 01384 824039 OR fill out the form below to get some advice and the opportunity to book your skin analysis. *If you book a Skin Analysis (regular cost £20), we’ll fully refund the amount if you decide to go ahead with a treatment. This article was written by skincare specialist Tej of Tej & Co.
Tej & Co are experts in skincare and hair removal clinic, West Midlands. Offering safe and results-driven non-surgical skin treatments including Endymed Skin Tightening.